I developed this website to provide monitoring services and also to keep an eye on ISPs. It is in Beta state, so be sure to check the logs to see changes. This entry was posted in #Blog on March 25, 2011 by Stanford. 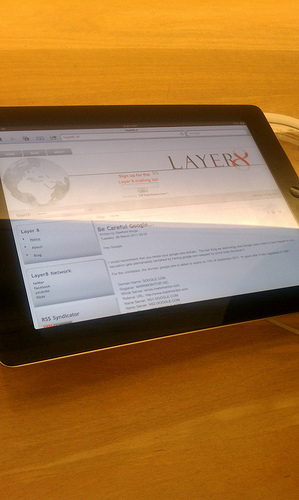 Layer8.VI on the Apple iPad 2 in San Francisco !! 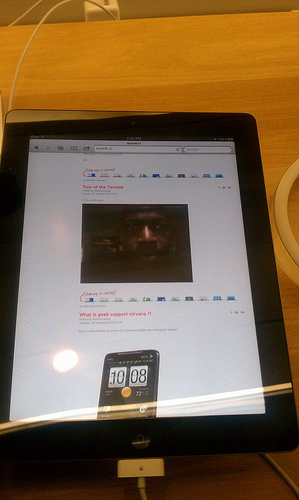 This entry was posted in #Blog on March 15, 2011 by Stanford. I would recommend that you renew your google.com domain. The last thing we technology and Google users need to have happen is your reputation gets permanatetly tarnished by having google.com swipped by some lowly domainer !! For the uninitiated, the domain google.com is slated to expire on 14th of September 2011. 14 years after it was registered in 1997 ! This entry was posted in #Blog on March 8, 2011 by Stanford.